Moving into a new home is an exciting adventure, and it's one that most would like to share with the people they are close to in life. A lot of friends and family members will want to see the new digs and the best way to fit everyone into the schedule is to have a housewarming party. In order to have a party that is successful, the hosts should follow some simple etiquette rules to make sure that they don't offend anyone and that everything runs as planned. Even when the party is a casual housewarming event, hosts and hostesses should still follow proper etiquette. Many people wonder if it is okay to host a housewarming party before the house is fully decorated - and it is perfectly fine! It can take a long time to get a house fully unpacked, organized and decorated. If a lot of time has passed, the house is no longer "new" and the point of the housewarming party is no longer viable. Unpack and organize enough to have a party and then have fun. Be sure to have dishes unpacked so guests can have a bite to eat, or buy paper goods. Be sure to have a bathroom facility with all necessary items and some sitting space for guests. Some people even like the idea of having the party in their new house before they begin moving in. Be sure to have tables, chairs, serving trays and eating utensils and plates to help make the party run smoothly. This is gives guests the opportunity to see the space before the owner redecorates or remodels it. The owner is the only one who can welcome guests into their new house. It is entirely appropriate to host the party for themselves; in fact, this is common practice. In some cases, a parent can host a party for their adult children who have recently moved into their own place or adult children can host one on behalf of their elderly parents. In most of these cases, the party is considered an open house rather than a housewarming party. Though registering is a growing trend, there are mixed opinions about whether or not it is appropriate. Some people register the same way people register for a wedding or when they have a new baby. Some experts feel this an appropriate way to assist guests in choosing a gift. Others feel that is tacky and appears to be a shameless way to ask guests for gifts. If the host does register, it is not appropriate to include the registry information in the invitation. If a guests asks whether or not the host is registered, the information can be shared. This will help the guest in picking items that will go with the new home's motif and color scheme. 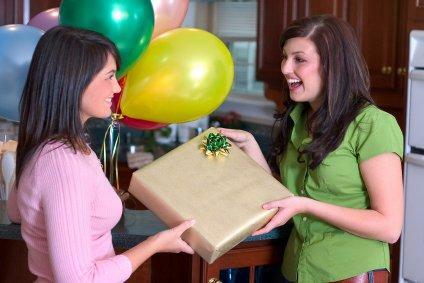 Many hosts write "No gifts" on their invitation to eliminate confusion if they do not want guests to bring anything. Food is usually a big part of every type of party and can enhance this kind of party as well. Serve finger foods that encourage guests to mingle instead of sitting in one place. A vegetable, meats and cheese or fruit tray are all appropriate. Be careful not to serve foods and drinks that will stain new carpets, such as red wine. If alcohol is served, have a designated driver or arrange for alternate transportation. A housewarming party is the opportunity to show guests around the new place. Be sure to give a tour of the place to each guest or small groups of guests that arrive. Show them any new additions or remodeling that was done and provide "before" pictures for them to compare to. If the work has not been done provide carpet swatches, tiles and paint chips so guests can visualize how the place will look when it is done. Hosts might also want to have a guest book for guests to sign. Attending a housewarming party can also bring up etiquette questions. Unless the host specifically requests "no gifts," they are typically expected. The guests who are interested in purchasing something should ask whether or not the host or hostess has registered somewhere. There is a lot of room for interpretation as to how much a housewarming gift should cost. There is no specific price that has to be met, and every situation is different. The guest likely knows the host or hostess well and will have some good ideas of his or her taste; this can be a good guide when choosing the gift. Smaller gifts such as house plants or stemware sets are common gifts. The host or hostess might also appreciate a gift basket filled with items to help them relax such as a candle and a good book or they might like to have a gift card to a home improvement store. If the guest wants to bring someone, such as a significant other, he should ask the host or hostess prior to arriving at the party. Typically the answer will be "yes," but it is usually wise to ask instead of creating some awkward situations. Both host and guest should follow basic party rules to help ensure a successful event. This includes introducing guests to each other in order to make things less awkward. Guests should arrive on time and should offer to help clean up after the festivities.